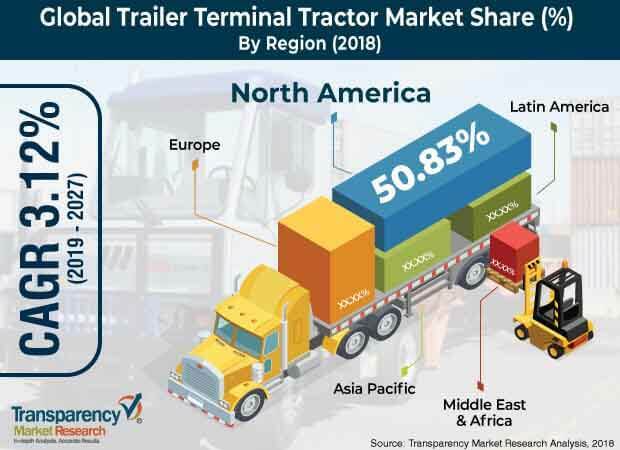 Transparency Market Research has published a new report titled, “Global Trailer Terminal Tractor Market - Global Industry Analysis, Size, Share, Growth, Trends, and Forecast, 2019–2027” According to the report, the global trailer terminal tractor market is projected to surpass US$ 650 Mn by 2027, expanding at a CAGR of above 3% during the forecast period. According to the report, the global trailer terminal tractor market is likely to be driven by a range of macroeconomic and industry-specific factors. North America is expected to be at the forefront of global demand, with the market in the region expanding at a CAGR of more than 2% between 2019 and 2027. Companies such as Cargotec, Konecranes, and Mol CY nv are providing innovative options for trailer terminal tractors such as fully electric trailer terminal tractor, autonomous trailer terminal tractor. This coupled with availability of engine with alternative fuel options is anticipated to boost the demand for trailer terminal tractor during the forecast period. Furthermore, port operator logistic handling companies are also constantly looking for new systems to cater to their requirements. High rate of adoption of diesel powered engines and growing use of LNG powered trailer terminal tractors by consumers, owing to the comfort offered while driving coupled with extra space, and more air and light, are expected to boost the trailer terminal tractor market during the forecast period. Stringent emission norms by port authorities have prompted manufacturers to develop more refined diesel engines. Moreover, a few trailer terminal tractor manufacturers are developing the electric trailer terminal tractor, which is expected to offer significant opportunities to the trailer terminal tractor market. Trailer terminal tractors offer numerous benefits over road trucks, such as the layout of the driveline, visibility, maneuverability, and chassis construction with an elevating fifth wheel. Consequently, adoption of trailer terminal tractors in port activities for handling of goods is increasing. Furthermore, trailer terminal tractor manufacturers are focusing more on the development of trailer terminal tractors for terminal operations. In terms of fuel, the global trailer terminal tractor market has been divided into diesel, hybrid, and electric trailer terminal tractor. Electric trailer terminal tractors are easy to maintain, as they contain less number of moving parts are easy to maintain, and are almost zero-emission. Consequently, the demand for electric trailer terminal tractor is likely to remain high. It is expected to drive the trailer terminal tractor market during the forecast period. However, manufacturers are also focusing on alternative fuel options, such as LNG based engines for terminal tractors and the development of more refined diesel engines, in order to meet stringent emission norms. Trailer terminal tractors are mostly used at sea ports for material handling, such as loading and unloading of materials. Fast turnaround time, low operating cost, excellent maneuverability, unique comfort, and easily accessible service points are boosting the adoption of trailer terminal tractors significantly. Furthermore, applications of trailer terminal tractors in the logistic industry, manufacturing facilities, and at industrial sites are increasing, which in turn is offering significant opportunities to trailer terminal tractor manufacturers. In terms of region, the global trailer terminal tractor market has been segregated into North America, Europe, Asia Pacific, Middle East & Africa, and Latin America. North America is projected to dominate the global trailer terminal tractor market during the forecast period. Consumption of trailer terminal tractors in North America is relatively higher than that in other regions across the globe. Prominent players operating in the global trailer terminal tractor market include AB Volvo, AUTOCAR, LLC., BYD Company Limited, CAPACITY TRUCKS, CARGOTEC (Kalmar), CVS FERRARI S.P.A., Hoist Liftruck Mfg., LLC, Konecranes, MAFI Transport Systems GmbH, Mol CY nv, Orange EV, SINOTRUK (HONG KONG) LIMITED, TERBERG SPECIAL VEHICLES, and TICO TRACTORS.